It will take in DC power and output single USB. It can only decode one "F" connector at a time, but you can switch in software from one connector to another, over and back. The photos show the first version, hand built. The 100 next units will be professionally assembled. Last edited by zg3409 on Thu Jan 11, 2018 9:56 pm, edited 1 time in total. My understanding is that it is aimed primarily at the US market and as it being sold from the US it is likely to more expensive once you've paid shipping and duty and VAT to get it in to the UK - plus you don't get the "I built that feeling" when you've completed it! That looks nicely made and very compact - though clearly it isn't a kit for novice home construction I don't see why it couldn't be assembled by those of us used to SMD and able to fit BGA parts. I see a 12V input. Did you consider an option of powering it off USB as well? I note there are switching regulators on board and the USB-3 standard should be able to produce enough 5v power for both tuners and while its marginal for standard USB, with just one demodulator active it should be possible also. I didn't do this for the BATC board*, Maybe you already did this and the 12V is just for external LNBs? Unfortunately as Noel points out, the UK tax and the high postage costs plus post office VAT collection fee will make it well over £100 in the UK. The options for DATV are certainly looking up. JP has developed an interesting European dual channel Minitiouner pro which will also be available ready built and has many additional features and Charles is working on software demodulators using PC graphics cards. Mike if you really would like a blank PCB I am sure something could be arranged. Be aware it does not use the same NIM tuner shape that the BATC units use. However I suspect you already have enough receivers by now. non US residents to work on it. I have enough receivers, too many, though not enough signals to receive, but thanks for the thought. Interested in the open source project. I just wanted to confirm that "Yes, the MiniTiouner-Express hardware unit will be available soon (within a few weeks) fully assembled, tested, and with a cover for US$75 + shipping (+ VAT where applicable)". Shipping within USA is US$ 6.00. International shipping outside USA is US$ 33. Six "first-article pre-production units" have been built by robots. Art WA8RMC reported that the solder-paste-mask needed to be adjusted under one regulator IC (too much solder paste had been applied). I will begin finishing a preliminary User Guide as soon as my MiniTiouner-Express unit arrives in the mail for me to begin testing. Differing from Noel G8GTZ's earlier understanding in this thread, the MiniTiouner-Express hardware is intended for anyone world-wide who does not already own a MiniTiouner unit or does not own a MiniTiouner unit with DVB-S2 capability and wants a lower cost unit that is already assembled and tested. 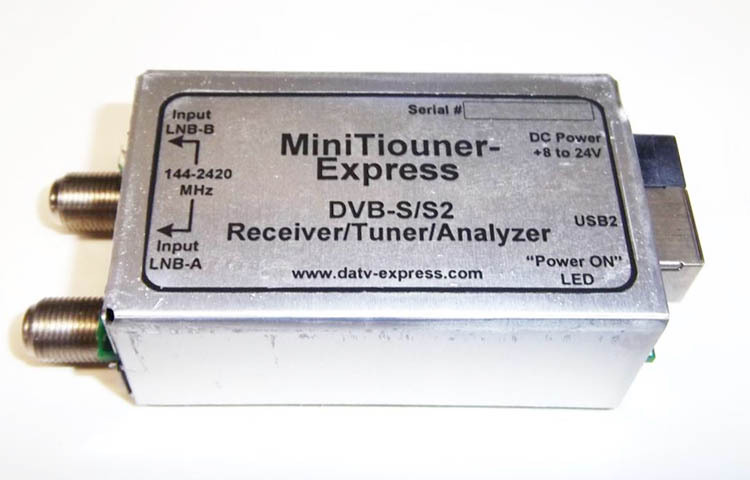 the MiniTiouner-Express hardware is intended for anyone world-wide who does not already own a MiniTiouner unit or does not own a MiniTiouner unit with DVB-S2 capability and wants a lower cost unit that is already assembled and tested. "or does not own a MiniTiouner unit with DVB-S2 capability", I think that you don't understand completely how works a MiniTiouner, since 2015 all MiniTiouners built (home brewed or BATC kit ) have DVB-S2 capability. The only argument is "already assembled" but , in Europe, for the same price we have the "MiniTiouner-Pro" already assembled and tested with many additional features and a dual stream receiver possibility. This is a common problem trying to get stuff to the EU from the US and vice versa. The shipping charges are killers so maybe we need a bulk shipment solution, in both directions. I must admit the $33 shipping does sound excessive but I am sure this just reflects what our US friends are charged by the likes of US Mail and UPS, having recently shipped some low value Christmas presents to the US and being mortified at the postage cost.How is it I can get something shipped all the way from China for so much less? Not only that but in the UK we have at least 20% tax due on the cost including shipping plus another £18-12 or so depending on the shipper we must pay to the courier to collect the VAT. Remember they have already had $33 for the shipment, this is extra. Then 3-5% currency conversion costs and a deplorable exchange rate. So a landed UK price will be ($75 + $33) x (0.76) x 1.2 + £10, or about £110 and maybe €120. OK so that's only $165 but its double the cost in the US and none of this extra is going to our US friends producing the equipment. Suddenly, it's not such a good deal compared to the REF and BATC offerings. Its probably just the same for US buyers hoping to get hold of the Minitiouner pro. This is a pity because we want to see lots of receivers being developed (and used) to suit all tastes and capability needs. There is an important application in AMSAT beyond DATV and while some people like to build things, others prefer not to or sadly can't any more due to failing eyesight. We are going to need thousands of these if the promised Phase 4 and Es-Hail Sat programmes are successful.